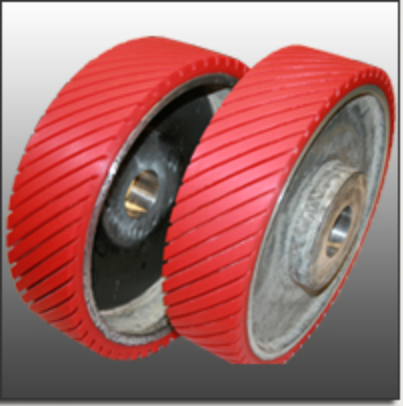 Urethane covered belt pulleys are made with or without crown for belt guidance. Rolls can be made with a rough finish for grip. 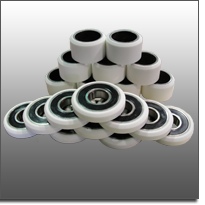 Guide wheel coverings are designed for high speeds and high load bearing capabilities. Drive wheels for belt sanders in either dry or water environments. Rolls can be grooved and tapered for added grip. Urethane belt sander wheels outlast rubber wheels by about 8 times. 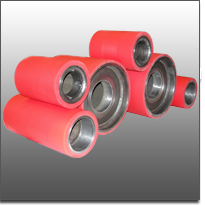 Guide roller coverings are designed for high speeds and high load bearing capabilities. UUP can strip and recover or manufacture complete.